We've modified the forum to support reading it on a smart phone. It's been on my personal wishlist for some time that we could add better mobile device access to the forum. The recent software upgrade has made this possible, and now the IKE forum is compatible with one of the most used mobile forum apps, Forum Runner. 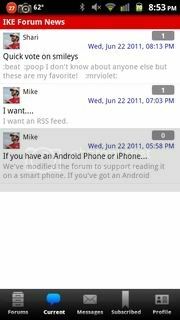 I've been using Forum Runner on my Android phone for about the last year, and it makes reading the forum on your phone much, much easier. I know that more and more members have smart phones, so here's something you might like to try. Forum Runner is available for iOS devices like the iPod touch, iPhone and iPad, as well as Android. It comes in two varieties...a free and a paid version. The free version will allow you to browse and read the forum easily. The paid version adds the ability to post, quote, start new topics, and more. And the paid version isn't all that expensive, it's only $1.99. The iOS and Android versions are slightly different, with the iOS version probably handling images a little better. The Android version doesn't do smilies it seems, but over time they do make improvements in the app. The topics and forms are large, easy to navigate, and formatted for a small screen. Across the bottom are buttons to view the entire forum list, view new posts (current), read private messages, view subscribed topics, view your profile, search, and see who's online. Anyway, it's my favorite new feature, I hope you like it too. Oh well... At least I've got this internet thing down! ...sort-of! Jeff ~ Thanks for all the information... I'm considering exchanging my pager and teletype for one of these new fangled picture telephones that don't have to be plugged into the wall! Amazing! ...next they'll be sending a man to the moon! Jynx wrote: Jeff ~ Thanks for all the information... I'm considering exchanging my pager and teletype for one of these new fangled picture telephones that don't have to be plugged into the wall! Amazing! ...next they'll be sending a man to the moon! When they do, you can follow it with the NASA app for your phone. My "smart" slowphone suffers from the OS best known for being the dominant PC OS . . . . translation . . . not a lot of apps, and not this one. Guess I will have to get a different phone if I want to emulate all you cool kids. OK I picked up Forum Runner, when I searched for IKE, I got no results. Android device here, any tips? OK, nevermind me. Searched for the exact url and found it at the bottom of a 42 result list. Seems a little silly but life goes on. Elix wrote: OK I picked up Forum Runner, when I searched for IKE, I got no results. Android device here, any tips? When I put in the keywords for searching, I used the full words, not IKE. Silly oversight. I've added IKE in, so hopefully others won't have an issue. I tried "IKE" "Illinois kite enthusiasts" and "www.ikeclub.org"
None of those showed this forum on the first page of results on my phone. Could be I got a "Dumbphone" by mistake? 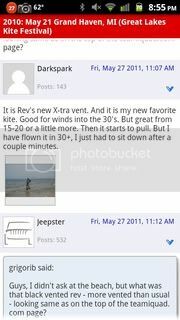 Elix wrote: I tried "IKE" "Illinois kite enthusiasts" and "www.ikeclub.org"
No, it's not you, it's their search. I get the same thing. If I search by name, I have to scroll through the results. Funny thing is, if I just search on the word "kite" I only get 4 results, and we're the second one. Maybe if you spelled it with only two "l"s you would have had better results? I did spell it correctly on the iPhone and I just double checked--same results. Jeff, Forum Runner sure makes you look handsome! There's an issue with avatars when your setting is to show the last post in the thread. I've been in touch with the developer and he thinks he has a fix. Oh how very cool!!! thanks! The avatar issue is finally resolved. The developer issued a fix for the problem where the wrong avatar was being displayed in the topic list.